'M&F' remembers the impact of the martial arts phenomenon in the world of fitness and film. Movie star, martial arts innovator, philosopher, cultural icon—Bruce Lee was all of these and more. 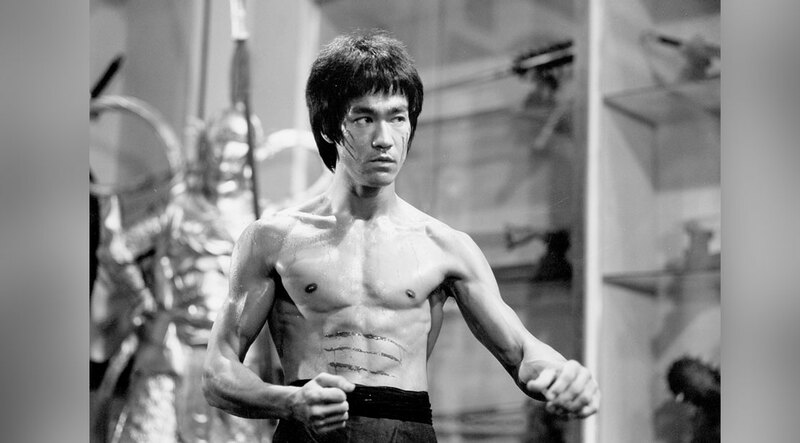 A singularly complex man, Lee holds our attention in his vicelike grip just as strongly today as he did back in 1973, the year most Americans were formally introduced to him as the star of Enter the Dragon and also the year he tragically died at the age of 32. In an era where MMA has supplanted boxing as the most popular combat sport, it’s hard to remember a time when the martial arts were strictly segregated. Yet Lee’s desire to break with tradition has influenced a generation and opened the door for the kind of fighting we see on our TV and movie screens today, as well as in the martial arts schools in our neighborhoods. His eclectic approach to his art set him apart from others. He understood that creativity could be attained only through freedom of the mind and only when applied without restrictions. To say Lee simply “created” a new form or “style” of fighting with his vaunted Jeet Kune Do is to barely scratch the surface of his unique combination of creativeness and concept. We remember the legendary film star and martial arts master through his pictures and his own words. To fully appreciate Lee’s impact, we must consider it in the context of his time. In the early 1960s martial arts were beginning to flourish in the Western world and they were totally institutionalized within the boundaries of schools that began to appear. Lee, having studied various kung fu systems upon arriving in the States in 1959, soon realized there was more to pugilism than the “Chinese” style of fighting. His counterparts in Hong Kong, like himself, had seen only similar systems of martial arts, as well as the training methods used to strengthen and condition their bodies, which had been passed down through generations. Lee, on the other hand, had been thrust into a world in which Western boxing and wrestling reigned supreme. It proved to be an awakening for the 18-year-old. In those days, a martial artist stuck to a rigid set of exercises—ones that had been passed down over the years. Lee, however, soon began to realize that the traditional martial arts he’d grown up learning were not the only ones available to him. It was then that he decided that any protocol he found that could enhance his body and overall skill set should be integrated into his training. Having broken away from the confines of tradition, Lee not only adopted Western styles of training, he also took nutritional and training cues from the bodybuilding community, even becoming a subscriber to Muscle & Fitness’ forebear, Muscle Builder, and purchasing a Weider barbell kit. By examining the various nutritional supplements used by bodybuilders and studying their routines, Lee was able to adapt and shape his body to complement his own personal martial art.